FRANKFORT (AP) — Gov. Matt Bevin has ordered budget cuts of 1.3 percent this fiscal year to meet a shortfall. The Consensus Forecasting Group earlier this month revised the estimate of tax receipts this fiscal year and projected that General Fund revenues will be $156 million less than previously budgeted. 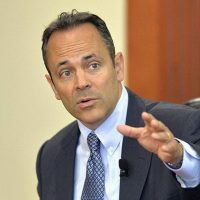 State Budget Director John E. Chilton’s office said in a news release Thursday that the cuts are less than Bevin requested earlier this year because the order can’t be used to replenish the state’s Rainy Day Fund. Bevin previously proposed cutting state spending by more than 17 percent this year. Chilton’s office said protecting spending on programs such as public education and corrections will be difficult in the next budget with additional expense expected, such as pension funding and Medicaid.